How Much Is Daycare for an Infant? Services aimed at the senior population do not come cheaply. 2 How Much Is Daycare for an Infant? The senior population is the fastest growing demographic in the United States, with more than 40 million Americans now over the age of 65. The senior population represents a huge target market to which for-profit businesses and nonprofit organizations can provide a wide variety of care services. These services, however, do not come cheaply; growing older has a hefty price tag. Many seniors choose to move to senior-oriented housing, where they can enjoy peace of mind and take advantage of a wide array of facilities and care options. There are three main types of senior accommodation: independent living, assisted living and skilled nursing facilities. Costs vary, depending upon the number of services the resident chooses to have, but it is not uncommon for monthly costs to range from $2,000 to $5,000 per person. A person requiring skilled nursing care and round-the-clock-monitoring can expect costs to be even higher. Geographic location and the quality of the specific facility will also factor into prices. Those seniors that choose to remain in their own homes can pay for in-home supportive services to assist them with the activities of daily living. These services range from simple housekeeping chores to skilled nursing assistance. This type of care commonly costs from $30 per hour. To give respite to family members looking after them, sufferers of Alzheimer's and other dementias can attend adult day programs. These provide daycare in a community-based group setting. Services are designed to provide social and some health services to adults who need supervised care in a safe place outside the home during the day. While nonprofits often provide these services for nominal rates, for-profit businesses may charge around $300 per day for this type of daycare. Senior care-related services are often provided by nonprofit organizations that charge on a sliding scale dependent upon ability to pay. The Older Americans Act provides for some services to be federally funded and offered by government entities free of charge. For-profit options will be more expensive. The federal government provides senior services through local Area Agencies on Aging administered through local government entities. Local Area Agencies on Aging can offer impartial advice on finding affordable senior care services throughout the country. Older adults and seniors often worry about the cost of paying for services such as in-home services and nursing home care in the future. Long-term care insurance is an insurance product that helps provide for the cost of long-term care, beyond a pre-determined period. 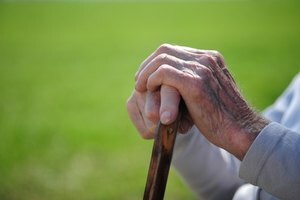 Long-term care insurance covers care generally not covered by health insurance, Medicare, or Medicaid. While this type of insurance can be very helpful, it can also be very costly, and premiums will depend upon how early the insurance is bought. For example, a person in her mid-40s, might pay $50 to $100 per month for this type of insurance, but a person in her 70s could pay more than $500 per month. Holly Johns attained a graduate degree in communications from Oxford University in 1987, and started writing professionally shortly thereafter. She has more than 20 years of experience in journalism and public and media relations, and has been published widely in publications, including "The Guardian," "The Daily Mail," "U.S. Stars and Stripes," and "Time Out London." Can I Be Paid for Being a Caretaker for My Parents?